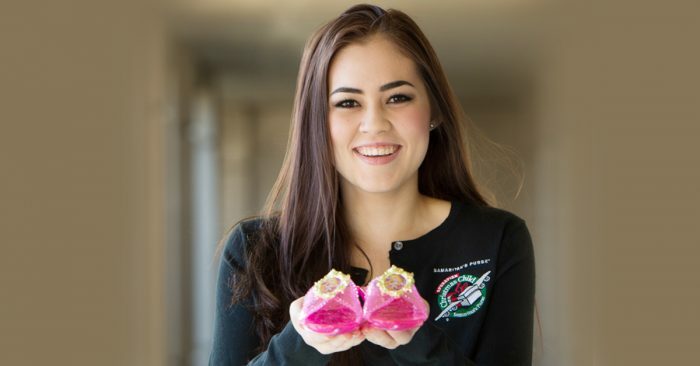 Alina received a shoebox at age five in a Central Asian country. Change another child’s life this Christmas with a simple shoebox. Find out how here. Operation Christmas Child delivers great joy to millions of children around the world through shoeboxes lovingly and prayerfully packed with gifts that will bring delight to a child. In the hands of local churches, every gift-filled shoebox is a powerful tool for evangelism and discipleship — transforming the lives of children and their families around the world through the Good News of Jesus Christ! After receiving shoebox gifts, boys and girls are invited to enroll in The Greatest Journey, Operation Christmas Child’s 12-lesson discipleship program where children learn what it means to faithfully follow Christ and share their faith with others. My family and I had what we needed, but gifts were a luxury we didn’t always get. So when I received a shoebox gift, I stood there baffled and confused. It seemed impossible for someone overseas, for someone I didn’t know, to send me a gift for Christmas. I carefully undid the tape and unwrapped it. In the box, there were ponytail holders, a toothbrush, socks, and candy. What caught my eye was a pair of plastic princess shoes. Those shoes were like nothing I had ever seen. They were pink, and I loved the color pink. I got so excited when I put on those shoes. They were too big, but I still wore them. I tried to wear them as much as I could. I showed them to everyone.